Milkshakes are such a big part of childhood. I always feel a little sad and as though I may have missed something essential about growing up because I was never into milkshakes as a child. Something important. Like a rite of passage, you know? I have never drunk milk in my entire life. I was already an adult before I would let myself to even try having a coffee with milk added. As a child, I thoroughly despised dairy milk (we didn’t even think about non-dairy alternatives so let’s not go there). So, milkshakes were something I eyed with a good measure of skepticism. Tall chilled silver glasses filled with fabulously flavoured milk … it was still just a lot of milk to me. Everyone would have their favourites … chocolate, of course, strawberry, banana, butterscotch, vanilla, pineapple, caramel … mostly standard stuff. But there was one flavour that had us all just a bit fascinated and intrigued. It had an air of mystery to it because we could never quite pin down what this fantasy flavour really was … blue heaven. It just sounds so celestial. So divine. As if it could transport you somewhere fabulous with it’s gorgeous sky blue mystery flavoured milkiness. Blue Heaven is an iconic Australian milkshake flavour invention that defied logic, by being madly successful. So successful, it’s still around today in various forms. Even my aversion to all things milky didn’t stop me from trying a blue heaven milkshake, out of curiosity. It tasted like vanilla, but somewhat disappointingly, like an artificial vanilla (which, of course, it was). Depending on where your research leads you, it actually was (and is) just artificial vanilla with blue colouring, or artificial vanilla raspberry with blue colouring. The manufacturers of the flavouring apparently claim it to be the latter. Now, that is cool, because raspberry is a fantastic mystery prize. Sure, it is artificial raspberry that never comes close to real fruit, but who would have guessed? I still don’t drink milkshakes, although I am partial to the odd smoothie. I do love all things vanilla and raspberry though … and blue food? I still love the idea of blue heaven as a flavour. Would it work in a non-milkshake form? Here in Australia, you can buy blue heaven syrup, blue heaven topping for ice cream, and blue heaven jelly. Well, that’s a bit artificial and boring, despite being a testament to blue heaven’s ongoing popularity. So why not create my very own version of blue heaven, from scratch? Real vanilla, real raspberry, and a little blue colouring for the sake of nostalgia? Why not create it in cupcake form? Good idea, yes? 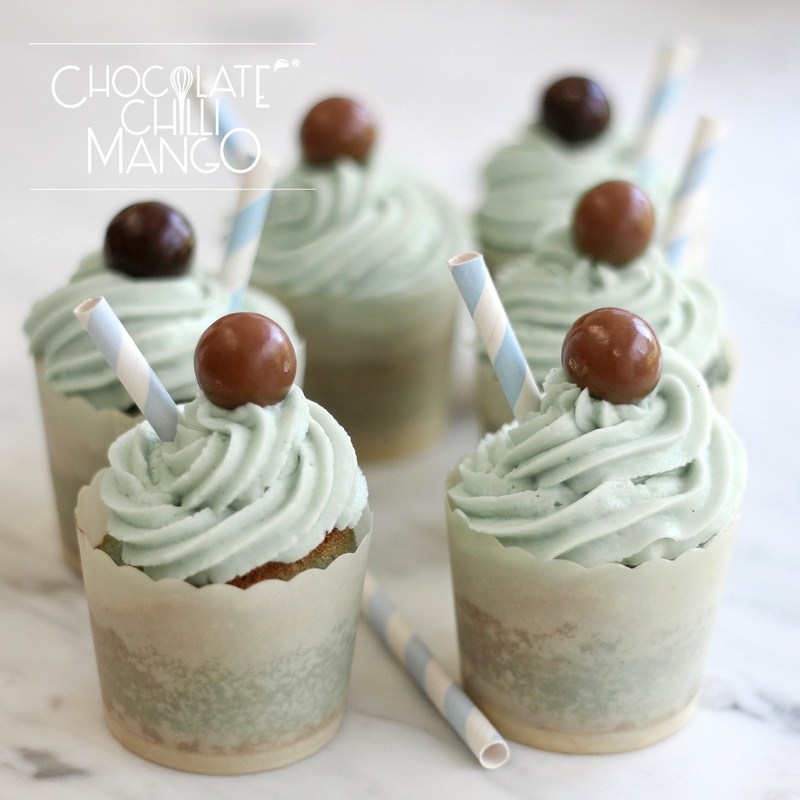 These moist cupcakes are pure vanilla and totally light blue, like the milkshake. The cream cheese frosting is also pure vanilla deliciousness and blue like the heavens. 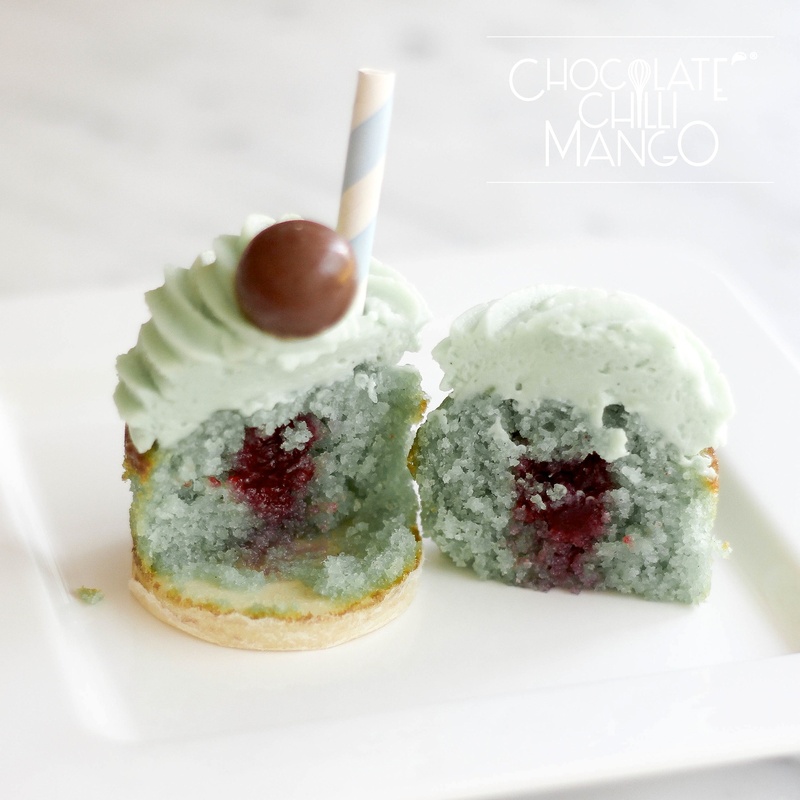 But take a bite of a cupcake and you get a surprise … a fresh raspberry confit centre, sweet and tart. I added some chocolate covered raspberries for decoration and little straws in honour of the milkshake that inspired them. Preheat the oven to 180℃. Place 10 cupcake liners on a lined baking tray and set aside. Place the sugar, butter, and vanilla in the bowl of a mixer and whisk until the mixture is light, fluffy and the sugar is dissolved. Add the eggs and whisk until the batter is smooth and light. Sift together the flour and baking powder. Add the lemon or lime juice to the milk. Add half the flour to the batter and beat until smooth. Add the milk and finally the remaining flour. Whisk the batter until smooth and light. Add a drop of blue food colouring and whisk until the colour is evenly distributed and the batter is a light pastel blue. If required, add another drop or two, one drop at a time. I only needed one drop to achieve a pale blue colour. Divide the batter between the cupcake liners. Bake for about 20 minutes until risen and cooked through. Remove from the oven and cool on a wire rack. You can store these, at room temperature, in an airtight container, if making ahead before filling and frosting. Puree the raspberries and strain them well to remove the seeds. Place the raspberry puree in a saucepan with the sugar and lemon juice. Cook over a low heat until the sugar is dissolved, stirring it gently. Raise the heat and cook until the raspberry confit mixture reaches 104℃. Test the confit by dropping a small amount on to a slightly chilled plate. It should start to set fairly quickly. When done, remove from the heat and transfer a small amount to a 12″ piping bag. Place on a workbench and let cool slightly. While the confit cools, cut a small round from the top of each cupcake and make a small cavity in the centre of each cupcake, about half of the way through. Remove the crumbs* but reserve the round cut from top. It will form a lid. Snip a small tip off the end of the piping bag and pipe a small amount into each cavity to just under the top of the cupcake. Replace the round cut from the top to form a lid on top of each cupcake. They are now ready to be frosted. Melt the butter and set aside to cool. Whisk together the cream cheese, icing sugar, and vanilla until smooth and creamy. Whisk the cooled butter until slightly thickened. Add the butter to the cream cheese mixture and whisk until smooth. 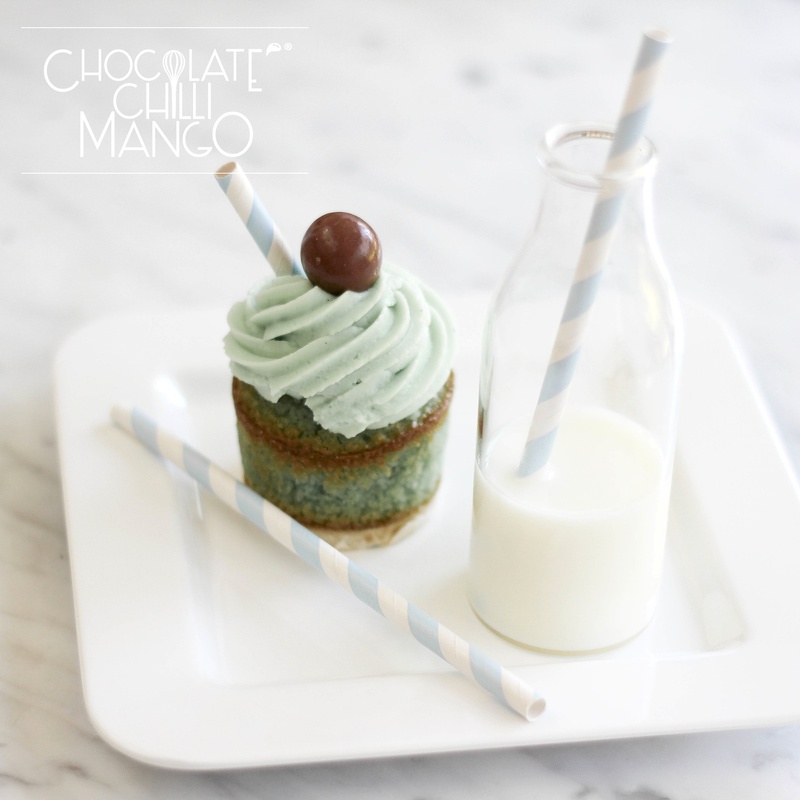 Finally, add a drop of blue food colouring to give the frosting a pale blue colour. Cover and refrigerate the frosting for 15 to 20 minutes before frosting the cupcakes. This cream cheese frosting pipes beautifully and holds its shape without setting or becoming hard on standing or when refrigerated. Pipe the frosting on to each cupcake. Top with a chocolate covered raspberry. 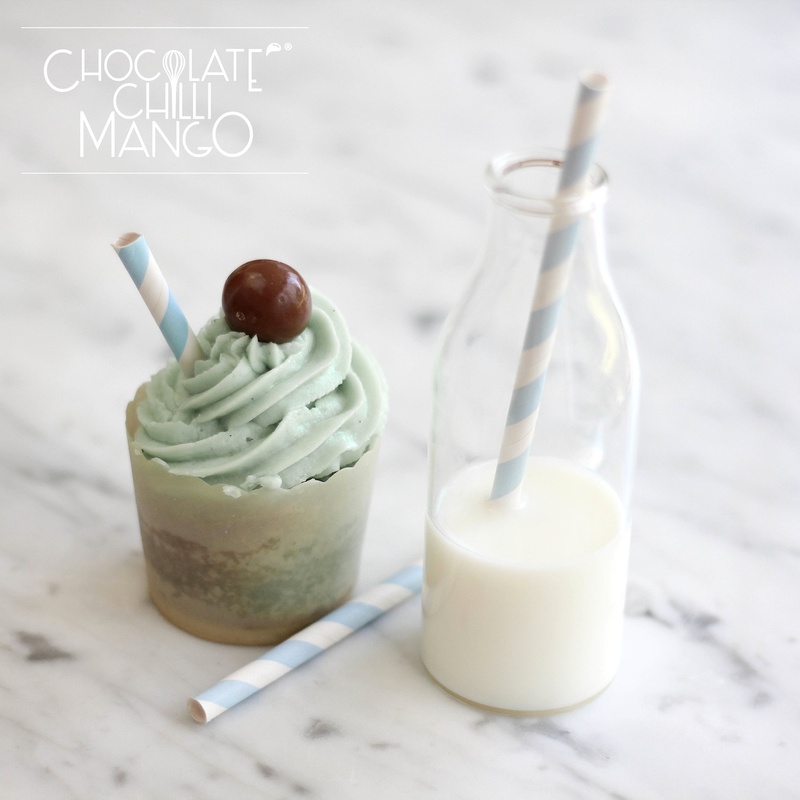 For that blue heaven milkshake vibe, add a small straw for decoration. I just snipped a standard straw into 4 equal pieces to get the right size for each cupcake. 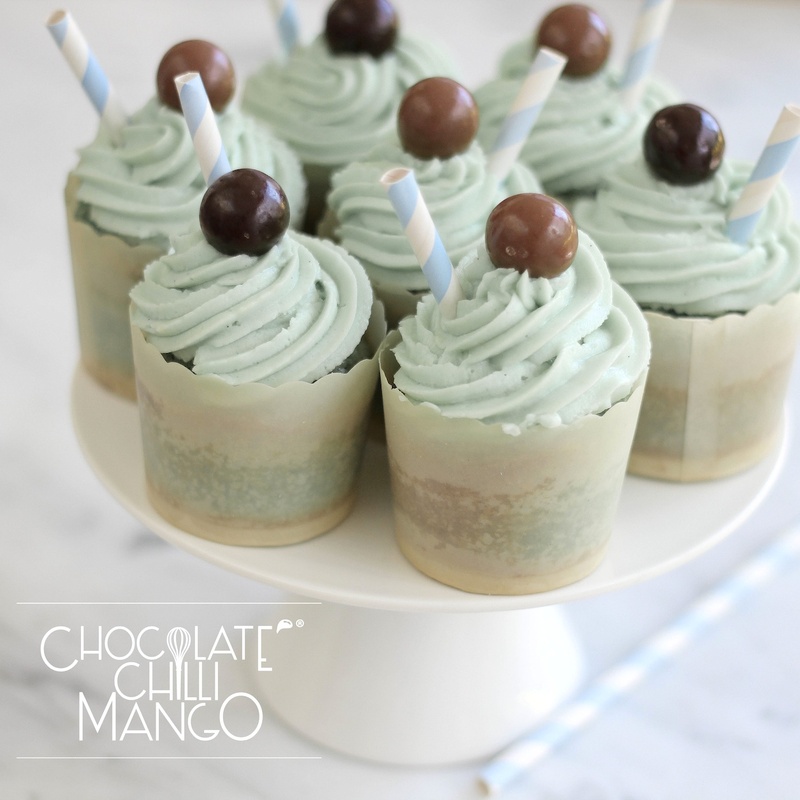 Without frosting, the cupcakes keep well for up to a week, if stored in an airtight container. Frosted, they must be stored in the refrigerator. They will keep for up to several days at least and will be as moist and delicious as freshly made.